Since 2002, the Rotary Euromeetings, have contributed a lot to bring Rotarians of different nationalities together in an environment of cultural diversity, mutual respect and recognition. This year it was time for Paphos and the island of Aphrodite to organize the host. Participation was open and the visitors included rotary clubs from Sweden, Germany, UK, Italy, Ireland, France, Belgium and Cyprus. From Thursday to Sunday, a lot of activities took place, like excursions to the Aphrodite’s Rock and other Limassol sites, a tour to Paphos archaeological sites, a visit to a winery at Vasa and a monastery at Omodos village. The official welcome was made by the Mayor of Paphos representative on Friday afternoon and visitors had the opportunity to experience Cypriot hospitality. 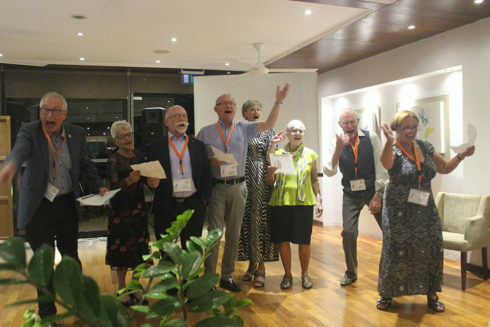 On Friday evening the Paphos Aphrodite Rotarians hosted for dinner all the European Rotarians at their homes. On Saturday evening a sumptuous dinner was offered including presentation by the participating clubs as well as the handover to the next organizing club in Bochum- Germany. Each club donated an amount towards a specific charity project. Paphos Aphrodite Rotary Club has decided that the money received will be offered for the local project, directed towards the Cyprus Rotary Mega project – the Cancer Detection unit for children at Karaiskakion.